I woke up this morning with mixed feelings. On the one hand, I was very excited to get back home to see Jo and Mia, my wife and daughter. 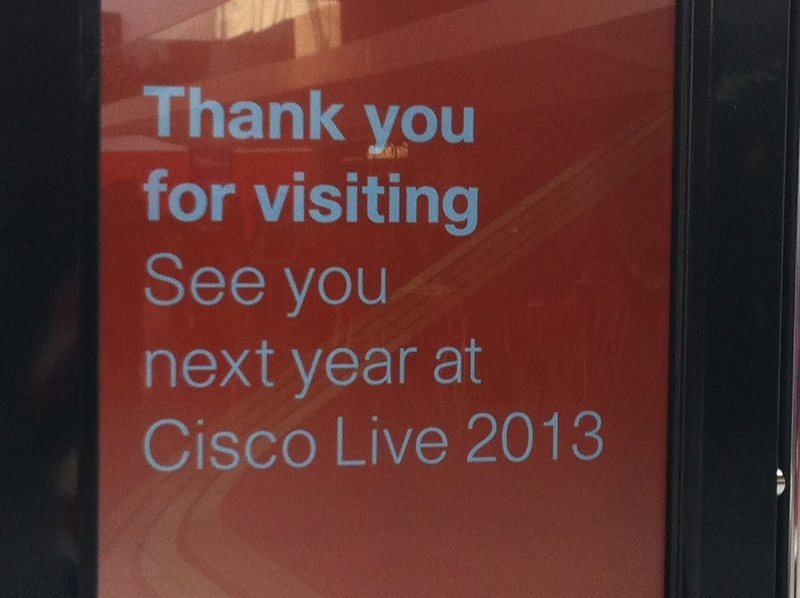 Although this week at Cisco Live London 2012 has been a phenomenal experience, I find that I really start to miss them both after a few days away. 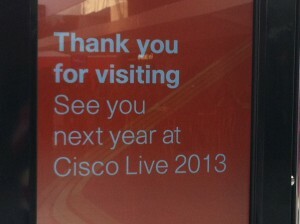 The flip side of that excitement was the genuine sadness that the Cisco Live week is over. I am very fortunate to have been here, learnt some amazing things and met some quality people. Once the dust settles a bit, I’ll post a summary of the week and explain why somebody in my position found it to be so incredible. OK, back to the task in hand – what happened on day 5. The last day is a half day and the World of Solutions section closed yesterday afternoon so I was keen to make the most of the morning and had booked in to two sessions. Funnily enough, these were the original two sessions that I had signed up for when I first got my online account. Pretty much every other session had been swapped about before I finally settled on them. The first session was on OTV. Max Ardica did a great job of covering the topic considering the 90 minute time frame, although it is one of the more easy to understand concepts. OTV is effectively a Layer 2 extension feature, which used in conjunction with LISP, for example, has some real potential. This is a relatively new feature that is maturing at a steady rate. Overlay Transport Virtualisation creates a tunnel or multiple tunnels over a Layer 3 IP network and allows Layer 2 communication across it. Assuming you have the bandwidth for it, it means you can VMotion across geographical locations and using this in conjunction with LISP will allow your external access to find the services in the new location with minimal outage (when I say outage, I am talking about a single packet drop, so outage is not really the right word). 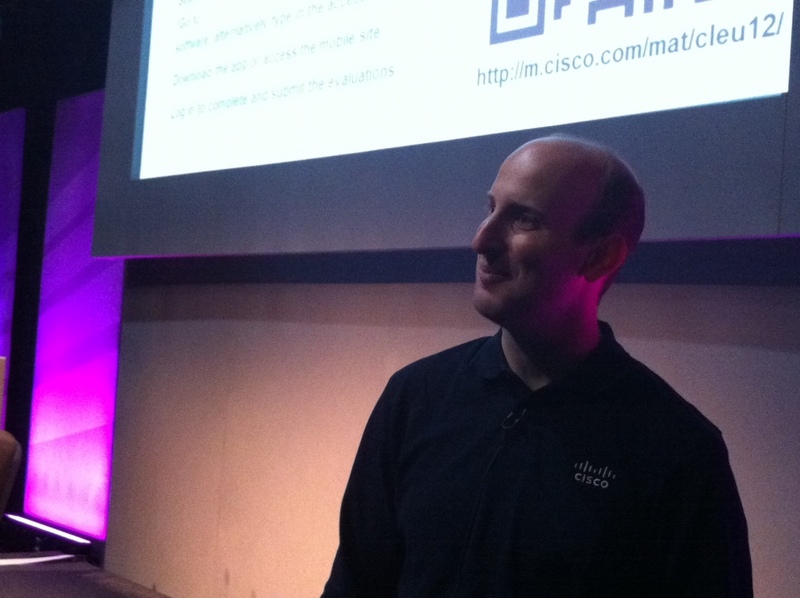 Despite the Cisco Live party last night and it being the last day both this and the last session of the week were full up, which surprised both presenters! The last session was on the evolution of IOS. This turned out to be more interesting that it might at first sound! First of all, Cisco are committing to making the whole numbering and release fiasco more standardised across all platforms. On that note, there is a strong desire internally to standardise the CLI platforms themselves but it’s not going to happen in the next 18 months. What will happen before then is a more frequent release of SM (standard maintenance) versions with regular EM (extended maintenance) releases. This harks back to the good old days but since 12.4\12.2 on the routing and switching platforms, the numbering system seemed to be set to reach infinity and releases were not nearly as common as they used to be. The presenter (whose name was not on the slide and whose face doesn’t match the name on the Cisco Live website for the session) was the first to admit that there are still a lot more improvements to be made. The subject of licencing of course reared its head and after reviewing customer feedback, the current model is being overhauled to a ‘Right to Use’ system, effectively based on trust. You use, you buy, but you can install an IOS for evaluation purposes and doing a ‘show licence’ will reveal which licences are under evaluation and which have effectively entered the ‘be honest’ phase. The IOS is moving to a more modular system, where each feature is available in a release and you turn on what you need. In addition, there was talk of feature virtualisation so that, for example, a firewall feature would run in its own computing process separately from OSPF, so that if one caused issues, it would not crash the entire system. Playing in to the modular approach, a role based access method could mean that your firewall guys could log on and only see the firewall process CLI, your routing guys the related processes etc. Perhaps too much granularity for anyone other than the really large shops but I can think of a few good use cases at my current role. Another feature coming down the line, which I thought was very cool and also long overdue, is the ability to have a Wireshark process running on a switch\router that could packet sniff without having to put a separate device inline. 1984 made easy, 28 years later. As a late snippet of something I learned yesterday in one of my IPv6 sessions, OSPFv3 will be supporting IPv4, hopefully from next year. Its improved convergence alone makes this good news, but nobody will be running IPv4 by the end of 2013 anyway, right?